Purchasing the best bedroom chair(s) may not be as easy of a task that you would think it is. You will need to take some considerations, especially regarding the design choice and of course the amount of money that you want to spend. Check out the Top 8 most comfy bedroom chairs that will surely offer more functionality and comfort in your bedroom. This Zenree lounge chair is perfect for long sitting hours ideal for your Netflix weekends or when you want to indulge yourself in binge-reading. This chair itself is made from Sherpa fabric. Its frame is made out of sturdy steel. 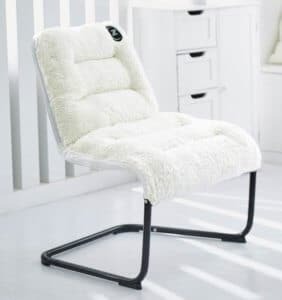 Offering great body support and plush cushion, the Zenree padded chair mixes comfort and fashion with its classic shape. Plus, it can easily add accent to your bedroom. 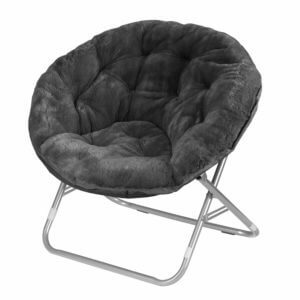 It has an ergonomic structure with a wide seat for excellent body support. The cushion is unbelievably soft and does not get hot even after extended hours of sitting. The chair’s legs are designed with floor protectors to protect your floor from scratches. When folded, the chair can be as small as a pillow – perfect for storage purposes. 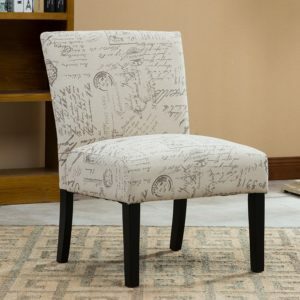 If you are looking for durability and comfort in one package, this contemporary accent chair from Roundhill Furniture makes an awesome choice. The chair is made out of polyester cotton fabric with sturdy legs designed for longevity. Not ideal as an office chair or when you want to work from home. It is quite a bit low for a standard desk’s height. Available in taupe and cream color, this armless accent chair offers a sophisticated style without compromising comfort and durability. It comes with an excellent pricing which is truly a great value for your money. Upgrade the looks of your bedroom with this velvet accent chair from Eggree. This chair highlights an ergonomic back support structure for truly convenient seating. Its legs have solid looks but is lightweight and easy to move around. It has a great height. Especially great for the desk or under the table in the reception area. 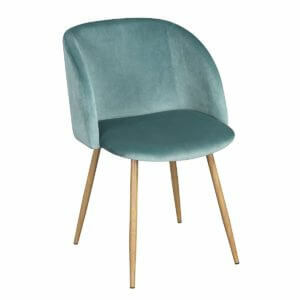 Made with an excellent soft cushion and stainless-steel legs, Eggree’s velvet chair will make a fabulous addition to your room. The velvet fabric makes it an elegant piece of furniture in the bedroom or the living room. 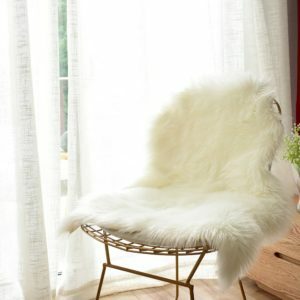 This gorgeous soft faux sheepskin cushion makes not only an exceptional seat cover but also offers luxurious comfort when you just want to get down on the floor for a cozy curl up. A great must-have decorative accent piece, this Carvapet Soft Faux Sheepskin cushion pad is made of an artificial wool on the front side. The back side, on the other hand, is made of soft ivory suede. It has the softness you and your pets will surely love. This armless accent chair from Roundhill Furniture is made out of polyester cotton fabric and comes with sturdy wooden legs with a classy deep espresso finishing. It features a tight upholstery design and quality construction designed for longer, even lifetime usage. It offers animpressing high-density foam padding for the back and the seat for maximum comfort sitting. Its contemporary digital fabric printing design easily gives a modern and sophisticated look to your bedroom. It is incredibly easy to put together. It may serve best as an accent chair only as it is pretty much low for a desk. If you are thinking of using it as an office chair you might need to consider this. This modern style armless accent chair offers a totally bomber look in your bedroom and best of all, it is easy to assemble. Perfect when you have a small or limited space in your room, this saucer chair makes a snuggly chair without occupying much space. It comes with a decorative modern design which instantly adds an upgraded look to your bedroom. This folding chair is easy to put together without the need for time-consuming assembly. It simply opens and folds just as easy for storage purposes. When the chair gets messy, you can’t wash it. It is only good for spot cleaning. So, if you want a functional seat in your bedroom that will not eat up a lot of room space with an added trendy look, this saucer chair from Urban is your excellent option. Made out of SmartMax fabric, this Big Joe bean bag chair comes with a bottle holder and functional built in pockets that can hold the remote controls, smartphones and even books pretty well. Its double-stitched cover and quality materials are a display of durability and quality construction. Made out of easy to clean fabric material for convenient cleaning using just a damp cloth when needed. It comes with a built-in handle so you can easily grab and move it to different rooms or areas in your house. The shape and structure of the bean bag is a big plus for comfortable seating. This bag uses environment-friendly products and is made out of recycled materials. The beans are also recyclable. As the nature of most bean bags, the Big Joe bean bag chair has a tendency to quickly go flat. The bean bag may easily lose its form and may not be able to hold up in its shape for too long. This means you may need to invest more in refill beans from time to time. 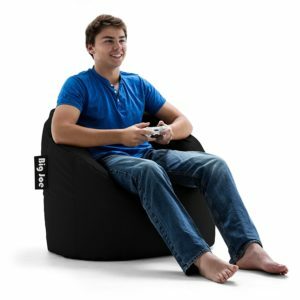 This Big Joe bean bag offers excellent comfort for hours of sitting for watching movies or video gaming. It is also refillable and it’s important to note that the UltimaX refill beans are separately sold. 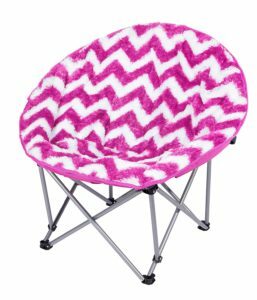 This saucer chair is perfect for Teens. You can choose between a pink and a blue version, which can come in handy especially when you have a daughter and son. (you dont want either of them to be jealous) It is also very suitable as a Christmas gift. Eventhough this chair is meant to be for teenagers, it holds up to 225lbs. A little bit costly, especially for a kids chair. The bedroom offers a much-needed comfort zone after a tiring and busy day. 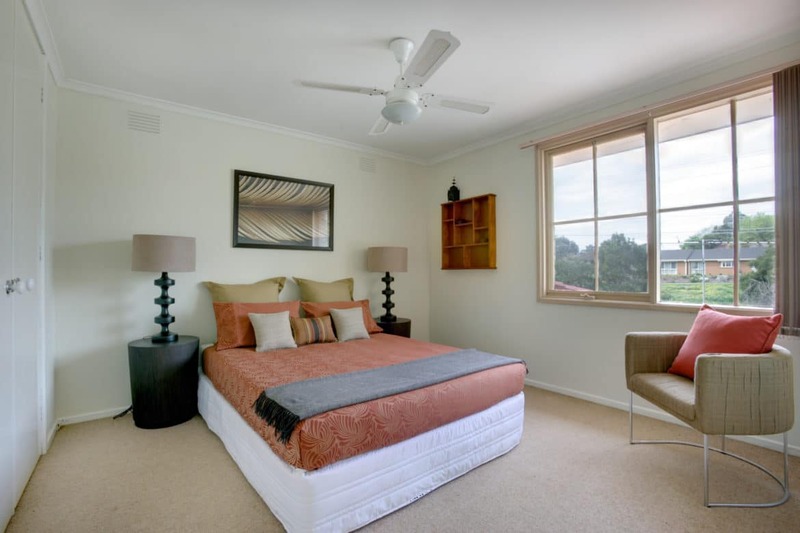 Getting the right furniture in your bedroom is important in keeping a practical and comfortable area in your house where you can rest or destress. Bedroom chairs are some of the most functional and versatile bedroom furniture you can ever have. In addition to the functionality they offer, they can also make a fantastic decorative accent to your room. Knowing the size of your bedroom will help you realise what the possibilities and limitations of your bedroom really are. Determine the size or amount of chairs that you want to equip your bedroom with. Your chair should not be too big to make your room look crowded. A smaller chair with just about the right size you will need for its purpose should be great. When choosing the bedroom chairs, you should also consider the entire bedroom’s design. Deciding on the right colours and type will be essential to picking the right chair for your bedroom. Your bedroom chair’s materials may vary from plastic, wood, rattan, metal, etc. When choosing the materials, you may consider cost and design. Apart from that, you may also consider its endurance and overall quality. A high price doesnt always mean that quality is guaranteed. A lot of the cheaper options do in fact have a similar level of quality. Look for the best and special features that may be included in the the offers online. Maybe the set that you’re about to purchase includes an extra pillow or a footrest. After a long day at work, your bedroom offers a private sanctuary where you can relax and recharge yourself from the daily grind. And, nothing beats the idea of having a cozy chair in the bedroom offering a comfortable place for you to sit down or curl up with a good book and a warm cup of tea. Before choosing the bedroom chair, think of how you want to use it. Will you need a chair for a cozy seat for relaxation? Do you want a comfortable chair for when you need to catch up on your reading? Or do you simply need them to add style to your boring bedroom space? That chic looking metal chair may look good but is hard on the back and offers the worst back support. Choose the bedroom chairs that are made out of quality materials and most importantly offers the right comfort you will need. 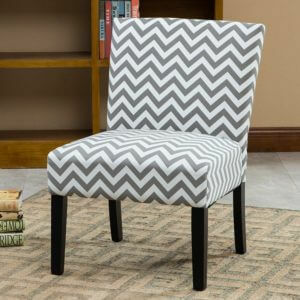 Your bedroom chair must be lightly colored as possible just like how your other pieces of bedroom furniture should be. The main function of your bedroom is for sleeping and relaxation. Choosing subtle colors, such as light pink or light blue, is important to maintain a relaxing ambience in your bedroom to promote quality sleep during the night. It’s always a wise idea to choose quality products that will serve their purposes for a longer period of time. It may cost you a bit more at first, but in the long run they are actually more practical. Choosing the right bedroom chair is important to optimize the comfort levels you will need in your relaxation and sleeping place. Having the right pieces of furniture in your bedroom not only makes your bedroom a great place for your sanctuary, it can also make you more inspired and boost your creativity. Amazon and Ebay are great places to find the ideal bedroom chair to suit your needs. Check out Amazon and Ebay now where you will have a variety of choices from the popular brands, designs, colors, sizes and more. Take advantage of the limited white sale offers and get more value for your money with affordable choices available. Don’t shy away from comparing prices and reading the customers review before jumping into a decision to purchase a certain product. Planning to buy a bedroom chair? The chairs on our list are certainly ones you should not miss out. More importantly, be sure to remember the few tips listed above. After all, it’s your bedroom and achieving the best level of comfort for your bedroom is one thing you should not downplay. Decorating a bedroom can become pretty costly, but it will not always have to. Depending on your budget there are endless solutions to pick from. Fortunately, with the different available products online, it will be easy to pick the perfect set of chairs without spending too much money. Stylish looks and quality materials are easy to find, even if you are on a budget. Lastly, if you think this post is helpful in deciding which bedroom chair to choose, feel free to share this post. Remember, sharing is loving! Our Top Pick is the Zenree Luxury Lounger Chair. Check out these interesting facts about bedrooms from Rubygemstone. If you are looking to further equip your place, make sure to check out our guide to finding the best living room chairs.